Are you in need of medical care? Look no further! With our skilled nurses, we can help you with your health care needs at home. Angel Care has Registered Nurses (RNs) who are dedicated to providing you with the proper assistance to improve your medical condition. We make sure that each patient is well taken care of in order to recover from their illnesses or injuries. Registered Nurses (RNs) and licensed practical nurses (LPNs) work as part of a health care team to provide skilled services that only professional nurses can administer, such as giving of IV therapy, wound dressing, education on disease treatment and prevention, and patient assessments. Physical Therapists (PTs) work as a part of the home health team to improve patient’s mobility and strength by exercising, massaging, and undergoing therapeutic modalities. Physical Therapists reduce pain and treat injured muscles with the use of specialized equipment. They also educate patients and caregivers with the special techniques in walking and transferring. Occupational Therapists (OTs) work as part of the health team to help patients with physical, developmental, emotional, and social difficulties and have a hard time accomplishing their day-to-day activities. 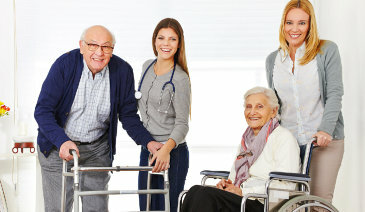 Occupational Therapists will teach the patients about using specialized rehabilitation techniques and equipment for the improvement of their daily and basic household routines. Speech Therapists / Language Pathologists work as part of the health team to help improve and restore the speech development of an individual which are results of trauma, surgery, or stroke. Speech therapists also help patients to regain breathing, swallowing, and facial muscle control. Medical Social Workers (MSWs) work as part of the health team to provide counseling and assessment of the social and emotional factors affecting ill or disabled individuals. They also help and guide patients and their family members in identifying available community resources. Depending on a patient’s needs, Medical Social Services are recommended as part of the home health care. They are prescribed by a physician to support rehabilitation after an illness, injury, hospital stay, or surgery. They can also help manage a chronic medical condition with the goal to prevent an unnecessary hospitalization. This care is provided in the comforts of your home by our specialized clinicians and continues until recovery goals are met. To know more about the services we offer, please call us at 781-281-7485 or 888-98-ANGEL (26435).